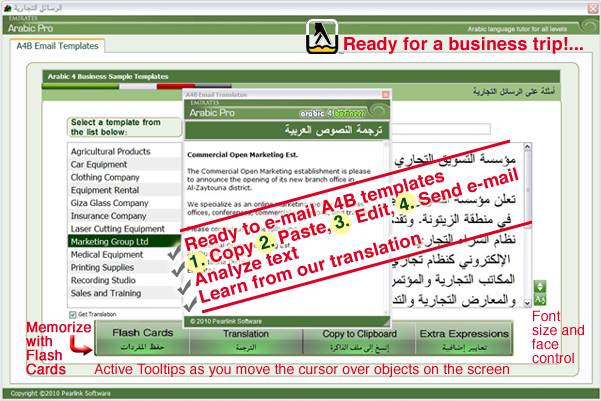 Arabic 4 Business: The student finds in this section of the program samples on writing and editing business correspondence in a variety of professions. This supplement will help greatly in written or verbal communication. Edit sentences, combine them, study their structure, find what advertisers and sales people do to win customers, but first of all, study the text, understand the context, check the sentences, edit them in your e-mail or simple text program, as well as learn from the English text translation about simple editting of business correspondence. These sample templates are drawn from actual business correspondences and may be used as tools for classroom activity to learn from, as well as to learn about some daily practical business trends.